During the 1913 waterfront dispute, Wellington wharfies (waterside workers) took over the wharves and stopped shipping there. The government called in special constables – mainly farm workers – to restore order and protect the main ports. 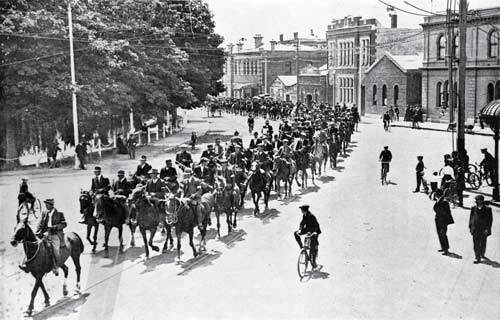 These 700 mounted special constables pass along Oxford Street in Christchurch on their way to Lyttelton to ensure strikebreakers could continue to work the wharves.